Desktop plaque is made of resin with the look and feel of natural stone, featuring artistic panel with floral motif and sentiment. Easel-back; 4" square. You'll know a mother by her voice...giving words of praise. By her arms...always open wide. You'll know her thoughtfulness...expressing faith in your abilities. By her hands...soothing bumps and bruises. For her care...encouraging your dreams. For her faithfulness...she prays for her children's needs. For her heart...making time for all who need her. A mother is always there for you...no matter how old you may grow. 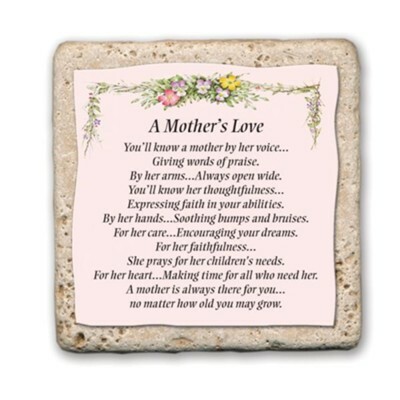 I'm the author/artist and I want to review A Mother's Love Sentiment Tile.